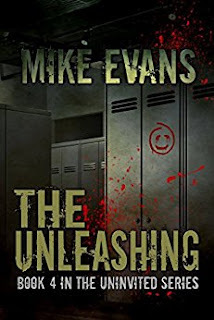 In what is set to be the final gruesome book in The Uninvited Series, it goes without saying that it very well might be the bloodiest. The Stranger had thought he was the last in his bloodline who carried the will to kill without prejudice, until now! Follow along with The Stranger as the questions left unanswered from The Unwelcomed are put to rest in a graphic and brutal tale of death and pandemonium! Ok this is a great ending to the series ,the author really ramped up the creep factor in this book . We get to follow the stranger as he heads home to see his children after about a decade . He thought he was the last of the line that had the will to just kill and enjoy it . But as he finds out one of his children has the want and desire to kill . Come along for the ride of a lifetime as the Stranger finally answers the questions that were left in book three. Omg the characters in this book just keep getting better and better . The Stranger has taken it up a notch in his killing sprees and the way he kills his victims . He is just evil and really you just want to stab him over and over . But he is also a father that wants to keep his protégé safe and help them get the desire to kill . There are so many characters that get killed in this book . can't name them all but they die in such gruesome and bloody ways . The kids are totally opposites of each other. one sweet and the other more like dad then anyone knows .